Thousands of Syrians have attended the funerals of the 44 people who officials say were killed in two suicide bombings in the capital, Damascus, on Friday. 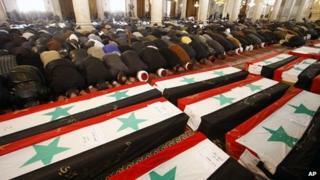 Mourners flew flags of the ruling Baath Party and held portraits of President Bashar al-Assad, in a show of support. The government says al-Qaeda was behind the alleged attacks, but the opposition says they were staged to justify the crackdown on anti-government protests. The violence came a day after a team of Arab League observers arrived in Syria. It is tasked with monitoring whether the government complies with a peace agreement that orders all troops to withdraw from the streets, with the aim of ending the violence. Syrian television broadcast live footage of the funerals on Saturday, with six coffins marked "unknown", as they were lined up inside the Umayyad Mosque in the capital's Old City. Mourners chanted "Death to America" and "We sacrifice our souls and blood for you, Bashar". Cleric Said al-Bouti said he hoped the attacks would lift "the veils on the eyes of the Arab League... so that they see who is the murderer and who is the victim". Religious Affairs Minister Abdel Sattar al-Sayyed read a statement he said was from Christian and Muslim leaders: "We call upon the Syrian people to be aware that Syria is being targeted, and affirm that we stand with them in the face of this plot. We reject any sort of extremism." No-one has said they were behind the explosions outside two security service compounds in the upmarket Kafr Sousa district of Damascus. Officials said a total of 166 people were injured. But opposition groups accused the government of orchestrating them. The main opposition coalition, the Syrian National Council, said "the Syrian regime, alone, bears all the direct responsibility for the two terrorist explosions" as it wanted to give the impression that "it faces danger from abroad and not a popular revolution". The Muslim Brotherhood, part of the SNC, said the government had set up a fake website purporting to represent the Brotherhood and claiming responsibility for the bombings. Senior Brotherhood figure Muhammad Riyad al-Shaqfah said: "They created a website which they called the MB website and posted a false statement. The website is false, and so is the statement." The main Arab League team has yet to arrive. Sudanese Gen Mohammed Ahmed Mustafa al-Dabi said he would go to Damascus on Saturday to head the delegation. About 50 monitors are set to arrive on Monday, with the team eventually reaching 150-200. Gen Dabi said he was "optimistic that the mission of the monitors will be successful". Reform activists fear Friday's explosions will spark a renewed crackdown on dissent. They said the violence continued on Saturday, with shelling in the city of Homs killing at least three people in the Baba Amr district.